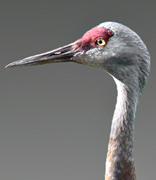 Cranes communicate by sounds and visual displays. Lacking hands, they "gesture" with whole-body postures and movements - body language that expresses emotion, can convey intent, and promotes social networking. This webpage includes displays and ritualized behaviors that cranes use to communicate with each other. 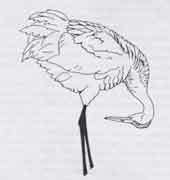 The postures and motor behaviors are like words in crane body lanuage. They can be appropriated in Dancing (Part 2) and can transition into Attack-defense (Part 3). 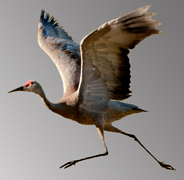 An excellent Field Guide to Crane Behavior can be downloaded as a pdf from the International Crane Foundation. For our dictionary of crane body language, we are especially indebted to the "Sociogram" of Ellis and colleagues and also to others referenced below. 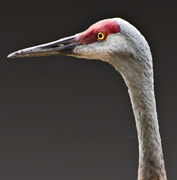 Very nice audio files of the Sandhill Crane Contact Call (Purr), Unison Call, and Guard Call, provided by the International Crane Foundation, can be accessed from the Baker Sanctuary Webpage. 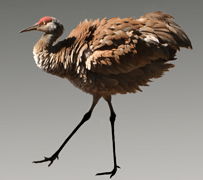 Waterford Press has recently published our Sandhill Crane Display Dictionary 9. We welcome emails that suggest improvements to this dictionary. The skin on the firehead has no feathers. 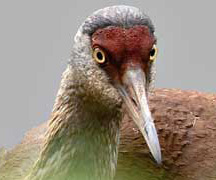 When the crane is relaxed, the bare red skin ends just behind the eye. Variable muscle contractions and blood engorgement of the skin account for the change. Aroused cranes flash more bare read skin by increased blood flow and contracting superficial facial muscles yo pull the read patch backward along the top of the head. The expanded red skin is like a flag announcing excitement. 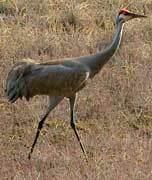 The crane points in the direction it intends to fly and emits a soft growl or purr. As lift-off becomes imminent, neck and head become more horizonal. Other cranes align themselves likewise before they take off as a group. Drawing from Voss8. 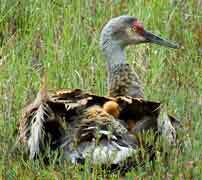 Tertial wing feathers are raised to create a bigger bustle at the rear. A component of Strut, Unison-call, and others. This display is often called "Tetial-elevation" by many authors. Bare red skin on the head is contracted. Bird remains still, watching and curious but not threatened. Display common in both sexes. This vigilance behavior is often shown by a few indivduals when a flock is feeding. On nest territory, it is shown by one parent when the other parent and colts colts feed. The posture has been called "Alert-Investigative" by others. Drawing from Tacha7. Bare red skin is expanded and the head is lifted high and slightly forward at right angles to the erect neck. Display common in both sexes. 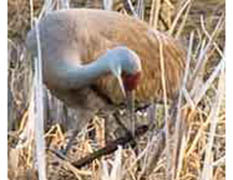 The crane carefully watches a potential threat, such as an intruder crane or a predator. If the threat approaches, the displaying bird may turn its bill away from the intrusion to emphasize its red crown while maintaining visual contact through peripheral vision. Drawing from Tacha7. A static display like Tall-alert with bare-skin expanded but with Bustle-up (tertiary feathers elevated). Often followed by Guard-call, Unison-call, or Strut. Called "Adorment" by Masatomi and Kitagawa in the drawing of a Japanese crane5. One crane turns sideways to another and walks with slow, measured steps. A stylized walking display with bare-skin expanded and Bustle-up. The crown may be titled toward the other crane. Called "Adornment-walking" by Masatomi and Kitagawa5 and "Directed-walk-threat" by Nesbitt 6 . 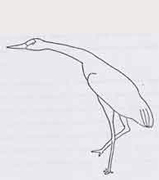 Drawing from Ellis2 is of a Siberian crane. 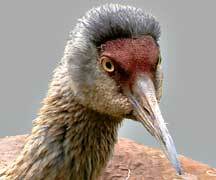 Feathers on the top of the head (behind the bare red skin) can be elevated and feathers on neck, slightly fluffed. Usually the bare skin remains contracted. 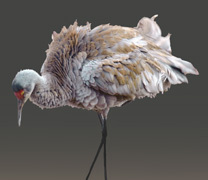 The head feathers are raised during grooming and ruffling. Sleeking of the feather tuft reflects mild arousal. The Run-flap may follow Intention-to-fly and leads to flight. It is also used in threat, attack and dancing. It reflects a high arousal emotional state. Masatomi and Kitagawa5 term this behavior "High-head dashing". In preening, the chin, crown and side of head are rubbed on back or wings. For combing, individual feathers are isolated and meticulously cleaned from base to tip. Low-arousal, socially contagious behaviors. Preening may be for hygiene or indicate ambivalence. After the head and bill are wiped across opening of the uropygial gland (preen gland) at the base of the tail, the oily secretions are distributed on the feathers of the back, the wing, the breast, and other regions. The secretions could lubricate and clean the feathers, repell parasites, and might contain pheromones. Birds may perform this display for hours. Masatomi and Kitagawa5 named the behavior "Oiling"and Johngard3 termed it "Back-slicking". 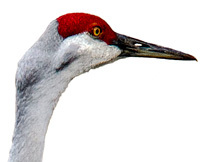 One crane tips its bill upward and extends its neck, waits a few seconds, and then paces forward with raised tertials and expanded bare-skin on the head. 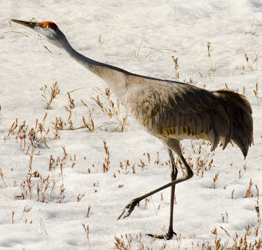 The other crane adopts a similar posture and follows in parade. As male paces toward female, he gives soft growls, termed pre-copulatory calls2. It has been called "bill raising" (Masatomi and Kitagawa5) and "parade march (Johnsgard3). 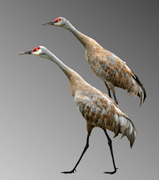 In our October 2010 Blogpost, we suggest that parade-marching cranes migth be smelling pheromones. During a "parade march" involving both members of a pair, the female turns her back on the male. He then gives a series of growls and she spreads her wings with secondaries drooping. The male approaches, steps on her back, and copulates. 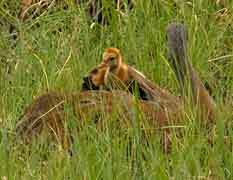 Copulation is followed by bowing, feather-oiling, and ruffling by both cranes. Excellent descriptions of the copulatory sequence for several crane species are provided by Masatomi4. Bare skin is contracted and feathers are raised and fluffed all over the body. Ruffle preening is used to dispel dust and feather dander. Ruffling with red skin expanded reveals arousal in dancing or threat. Threat Ruffles include walking with head held low (above left) or bowing and gyrating from side to side (drawing from Ellis2). Threat ruffling may be accompanied by a soft moan2 that is inaudible to observers in a field situation. An antiphonal duet of a mated pair. 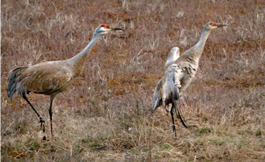 The birds stand side-by-side with necks upright and the male (right in the photo) rapidly tilts his head upward as he makes each call. The female lifts her head to 45°. 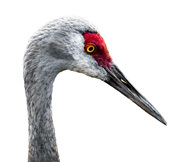 To hear a recording of a Unison Call, courtesy of the International Crane Foundation, click on this hyperlink to the Baker Sanctuary webpage. Almost every day during summer nesting season, the male on territory sounds a bugling call, much like his unison call segment, and pauses for ~15 seconds. If a neighbor crane (1-3 km away) answers, he responds and the two exchange calls. If there is no answer from the usual neighbor, the male may fly off toward neighbor's territory. He returns in 1-3 hours. The call is also used by members of a pair when they are foraging independently and out of visual contact. For the first several weeks of life, the colts sleep at night under the protection of their mother's wings. Colts signal their intent to "enter-tent" by gently pecking at the mother. Male or female manipulate grasses and cattails with their beaks. The behavior may trigger nest-building by the other member of the pair. If the mate doesn't join in nest-building, that specific site is rejected and they walk on. 1. Caro SP, Balthazart J 2010. Pheromones in birds: myth or reality? J Comp Physiol A 196:751-796. 2. Ellis DH, Swengel SR, Archibald GE, Kepler CB 1998. A sociogram for cranes of the world. Behavioral Processes 43:125-151. 3. Johnsgard P 1983. Cranes of the World. 2. Individualistic and social behavior. Papers in Biological Sciences, University of Nebraska, Lincoln, pp. 11-24. 4. Masatomi H 1983. Some observations on mating behaviour of several cranes in captivity. J. Ethol. 1:62-69. 5. Masatomi H, Kitagawa T 1975. 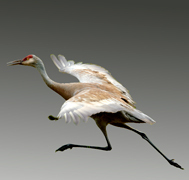 Bionomics and sociology of the Japanese Crane, Grus japoniensis, II. Ethogram. Jour. Fac. Sci. Hohhaido Univ. Ser. VI, Zool. 19:834-878. 6. Nesbitt SA, Archibald GW 1981. 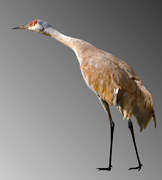 The agonistic repertoire of sandhill cranes. Wilson Bulletin 93:99-103. 7. Tacha T 1988. Social organization of the cranes from midcontinetal North America. Wildl. Monogr. 99:1-37. 8. Voss KH 1977. 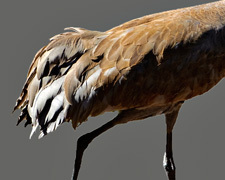 Agonistic behavior of the Greater Sandhill Crane. 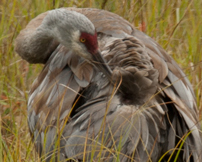 Eastern Greater Sandhill Crane Symposium, pp. 63-85.